Many Christians have learned and sung the song, “Joshua fought the battle of Jericho” when they were younger. Although the song tells of the famous battle, what many people do not know is that Joshua became the successor to Moses and led the Israelites into the Promised Land. Joshua’s story and character profile is one that all Christians should appreciate. We first find Joshua called upon by Moses not long after leaving Egypt to select men and go out and fight against Amalek, whom had come to fight against the Israelites. During the battle when Moses held up his hand and Israel would prevail in battle. However, when he tired of holding up his hand and lowered it, the forces of Amalek prevailed (Exodus 17:8-16). This gave cause to Aaron, Moses’ brother, and a man named Hur to provide a rock for Moses to sit on so that they could hold up Moses’ hands until the battle was done at sundown. Joshua and the Israelites won the battle and the Lord told Moses to write what happened and tell it to Joshua, adding that he would one day put out of remembrance of Amalek from under heaven. This is the first suggestion that Joshua would play a greater role in the future. Later, as Moses was called up upon Mount Sinai a second time, he took Joshua with him as his minister (Exodus 24:13). 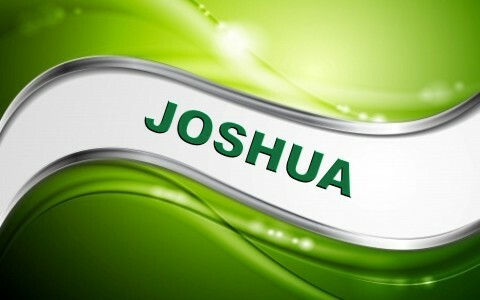 Joshua continued to serve as a minister, or servant, to Moses that proved not only his devotion to Moses, but also to God (Exodus 33:11; Numbers 11:25-30). When Moses came down off Mount Sinai another time after receiving the law engraved in stones by God it was Joshua, who accompanied him, that first noticed the noise coming from the Israelite camp as they were singing and dancing while they worshiped a golden calf (Exodus 32:15-19). Joshua proved his faithfulness when called upon by Moses, as directed by God, to choose a man from each tribe to go into the Promised Land and spy out the land and bring back a report (Numbers 13). The men returned after 40 days and gave their report. Ten of the spies reported that the land was flowing with milk and honey and even brought a sample of the fruit they had found. However, they also reported that the land had walled cities and large numbers of people, including the Amalekites, among other powerful groups. One of the spies, Caleb tried to calm the people and challenged them to immediately go and conquer the land. Instead of being inspired, the other spies began discouraging the people by telling them that the people living there were too strong and could not be conquered. Upon hearing this, the people began an all-night vigil of weeping and complaining that Moses and Aaron had led them into the desert to die. They soon decided that they should get new leadership and return to Egypt. This reaction caused Moses and Aaron to fall on their faces before the people. Joshua and Caleb could not believe what they were hearing so they tore their clothes in anguish and began speaking to the people. They told of the riches of the land and rebuked them for rebelling against the Lord. The people responded by picking up stones to stone them. Immediately the glory of the Lord appeared before them in the Tabernacle. The Lord told Moses that He was going to destroy the people and make of Moses a greater nation. When Moses heard this, he pleaded with God not to destroy them. God then pardoned the people and proclaimed that those who were 20 years old and up that had rebelled would die in the wilderness. Those that had not rebelled, along with the little ones, would be led into the land by Caleb and Joshua. This led to great morning among the people. Long after, God showed Moses the Promised Land from the top of Mount Abram. He told Moses that he would not be entering the Promised Land. Moses responded by asking God to appoint a man over the congregation (Numbers 27:12-23). It was then that God told Moses to take Joshua and set him before Eleazar the priest in front of the congregation of people and ordain him as the leader to take them into the Promised Land. With this challenge, the people responded that they chose to serve God and reject the other gods of the people who lived among them. Joshua marked their words by building a stone memorial as a witness to their proclamation. Unfortunately, as the people went back into the land, they did not keep their commitment. Instead they adopted the cultures, practices, and gods of those around them. Likewise, they intermarried with the others as they had said they would not do. This resulted in the angel of the Lord rebuking them. The people were grieved and only then did they serve the Lord while Joshua continued as their leader (Judges 2:1-9). Eventually, Joshua died, along with all of those of his generation, and a new generation arose after them. They did not know of the Lord or the mighty works he had done for Israel. Without Godly leadership and education, they abandoned the Lord and followed after other gods. This resulted in God allowing them to be conquered and sold into slavery once again (Judges 2:10-15). Joshua started out as a brave man who served Moses, both as a servant and military leader. As he spent time with Moses, his faith grew to such that he was undeterred by what most people considered to be insurmountable challenges. This led him to be more courageous as he constantly sought God’s counsel and strength. While he was a leader that challenged people to be faithful and holy, his death revealed a weakness in those who came after him to carry on his example to the next generations. Joshua serves as an example to believers of how humility, devotion, and faith can empower us to become great leaders for God. I have searched for a long time, finally someone who is very knowledgable and gifted about the bible! What was Joshua’s education like? What did his peers and teachers say about him? Hello my friend. We do not know much about Joshua’s upbringing, but we do know Joshua was a faithful servant and must have learned much from Joshua. I don’t think Joshua cared about his peers or what teachers said about him. Thank you for your question. His willingness to seek the Lord’s will first and foremost and his obedience to it. The victory was the Lord’s, not Joshua’s or Israel’s. Next post: Is The Idea Of Having A Soul Mate Biblical?